1. A simple-to-use instrument often used to detect logic levels is the ________. 2. A logic probe is placed on the input of a digital circuit and the probe lamp blinks slowly, indicating ________. 4. A logic probe is placed on the output of a gate and the display indicator is dim. A pulser is used on each of the input terminals, but the output indication does not change. What is wrong ? (a) The gate may be a tri-state device. (b) The output of the gate appears to be open. (c) The dim indication is a result of a bad ground connection on the logic probe. (d) The dim indication on the logic probe indicates that the supply voltage is probably low. 5. 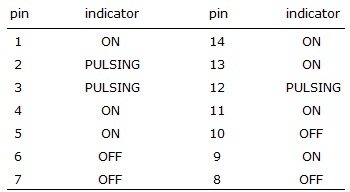 A logic probe is used to test the pins of a 7411 IC with the following results. Is there a problem with the chip and if so, what is the problem ? (a) Pin 6 should be ON. (b) Pin 6 should be pulsing. (c) Pin 8 should be ON.